Homepage Mobile Phones LG LG Rumor is announced by Sprint with an affordable price. LG Rumor is announced by Sprint with an affordable price. Although the LG Rumor has a midrange appearance the guys at Sprint are launching this new Qwerty style phone at entre level with an enter level style price. The reasonable stylish looks of this phone give its attraction along with an integrated POP3 email client, although it does have a rather slow 1xRTT radio. 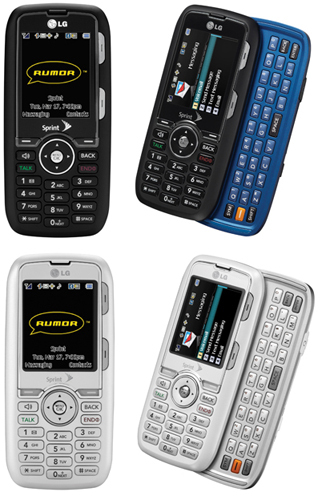 Other features include media player, microSD expansion, Bluetooth, Sprint navigation, 1.3 megapixel camera. The LG Rumor is available in 2 colours black/blue or silver, and also incorporates integrated access to Xanga and Facebook. So if you are into email and online communities you’ll enjoy this phone. Take a look at the image below to find out if the LG Rumor is your kid of phone. Previous article Previous post: Opticom Big Button Corded phone. Next article Next post: Binatone Caprice 600 TAM phone and Answer Machine. Hey ive had this phone since Chrismas, and someone just recently told me there was a way to listen to music on here, but i never quite understood how the music thing works. Im pretty sure that you need a micro card (which seems to be nothing more then a memory card) and im not sure what you have to do after that. So if anyone can explain to me what to do to get music on this phone, would be much appreciated.